Ann Norton (1905-1982) was a celebrated local sculptor and art instructor, and her former home now serves as a museum to more than 100 works of art she created. The Ann Norton Sculpture Gardens encompass her home-turned-gallery, her artist's studio (an airy building with beautiful windows and skylights for natural light in which to work on her sculptures of all but the largest sizes), and a meandering path through an extensive collection of native palms, the largest collection north of Miami. This unique location, with its secluded, intimate feeling, is situated steps away from the historic Flamingo Parks district, just minutes from bustling downtown West Palm Beach and luxurious Palm Beach Island. According to the Ann Norton Sculpture Gardens' website, Ann Weaver was a young artist when Ralph Norton, an industrialist from Chicago, retired to West Palm Beach and brought with him an art collection and a desire to share that art with the community. He established the Norton Gallery and School of Art in 1940, and Ann was hired in 1942. After the death of his wife in 1947, Ralph courted Ann, marrying her before dying several years later in 1953, leaving her the resources to continue work on her sculptures. Before her untimely death in early 1982 from leukemia she worked fervently with Sir Peter Smithers, a local gardening enthusiast, to establish guidelines for the future of her gardens and property. These guidelines have kept the gardens open to awed visitors for over thirty years, surviving hurricanes and drought, and will continue to impress for many more years to come. 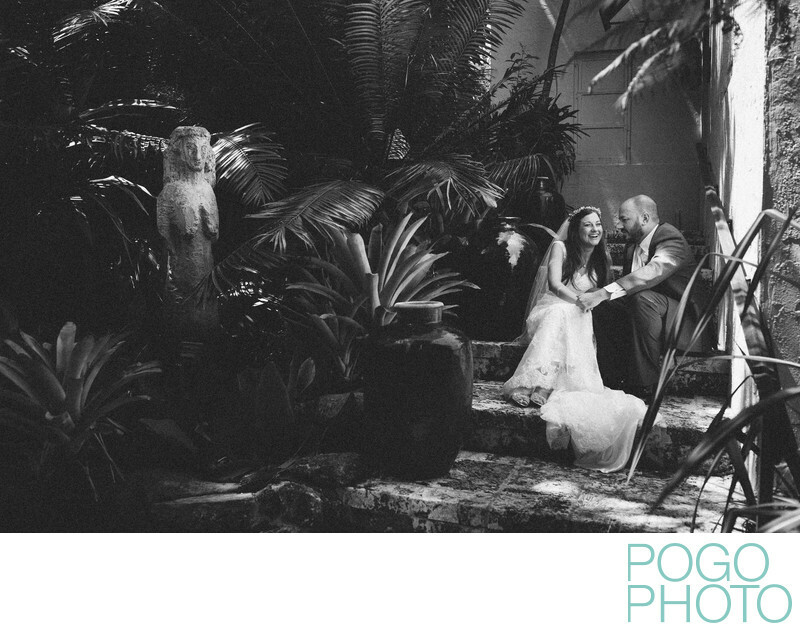 The choice of black and white for this images is deliberate; typically a tropical image is dripping with saturated colors, but the lack of color in this choice draws your eye first to the laughing bride wearing flowers in her hair, enjoying a private moment with her new husband at the door to the studio. One of Ann Norton's smaller sculptures is peeking out of the lush palm fronds, and the coral pavers lend an air of tropical luxury and practicality to the locale. 1/640; f/4.0; ISO 200; 35.0 mm.